Ghent occupies a unique space in the cultural landscape of the august city of Norfolk. But what is exactly it that seems so special? It’s not our oldest neighborhood — that honor likely goes to downtown, but Ghent on its own is possessing of a flavor unlike any other in the region. Old world charm meets old money intersecting with youth culture, commerce, and art in a way that really hasn’t been duplicated in the same exact manner anywhere else. In examining the odds and ends that translates into what makes this collection of 19th century streets so special, I should in all fairness disclose a salient point. Ghent is my home — once upon a time back in 1999, I bid a forever farewell to Chesapeake and moved into a tiny studio apartment on Boissevain Ave smack dab in the middle of Ghent. My rent was $415 a month, all utilities included. I pay over three times that now. And while that space is now long gone — it fell victim to fire in the early years of the new millennium — the pull of this area has kept me deeply in love with the neighborhood in which I live. 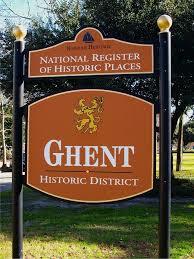 What is it that makes Ghent, Ghent? Prior to its initial development, Ghent was a large tract of farm land called “Pleasant Point.” There are conflicting stories as to where the name, “Ghent,” comes in. 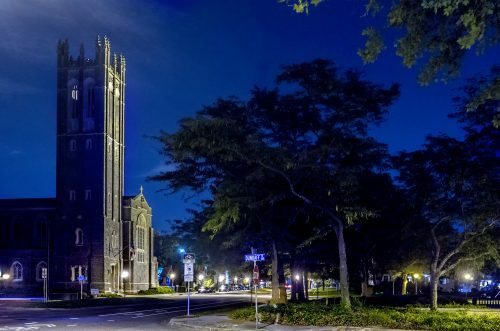 Some say it was envisioned by wealthy landowner and early Norfolk resident — Jaspar Moran, who purchased the farm and built a home — naming it Ghent after the city where the treaty ending the War of 1812 was signed, in honor of the end of a war he fought in. Others say that a later owner of the home, Commodore Richard Drummond, picked the name after one of his ships ferried the actual copy of the treaty across the Atlantic. 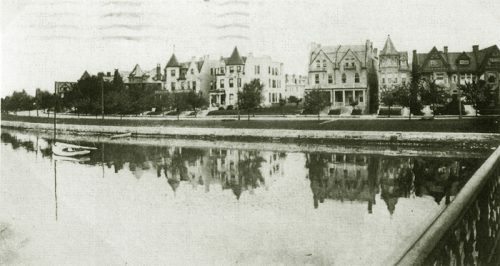 Either way, the district began development in 1890. Most of the initial construction took place between 1892 and 1907 — beginning along the Hague at what is now Mowbray Arch. Marshland was filled in to provide a semi circular shoreline. By the late 20s, most of what we think of as the neighborhood was in place. While it was economically successful for the first 60 years, a downturn through the 70s and 80s and resultant revival has created one of the most economically diverse areas in the city. Great cities have traditionally been built alongside great bodies of water. 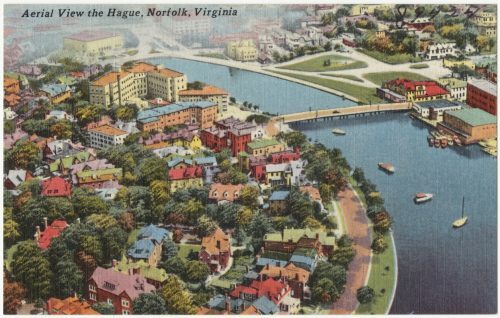 I wouldn’t say that the Hague qualifies to that degree so much — but as Norfolk is nestled against the banks of the mighty Elizabeth River, so is Ghent positioned against this scenic little waterway. Originally referred to “Smith’s Inlet,” it was renamed to further reflect the intentions of Ghent’s developers to mirror our sister city way over in Belgium. The very first homes of Ghent were built along its edge, and while in days past their glory had perhaps diminished through times of economic struggle — today these beautiful examples of 19th Century craftsmanship stand tall and beautifully restored. Mowbray Arch provides one of the more iconic representations of this neighborhood — if you haven’t been sightseeing down it’s paths, I highly recommend you take the time. In the here and now, the Hague defines us more than ever as we enter an age of rising sea levels. Tomorrow, Ghent could be defined by floodzone issues as much as by it’s character and charm. How we handle those challenges will likely determine how citizens of the 22nd Century view our beloved borough. If they’re still able to see it at all, that is. For my money, nothing speaks to the soul of a neighborhood more than its architecture. And Ghent doesn’t disappoint in this regard. Colonial Revival meets Queen Anne styling with eccentric dashes of everything from Spanish inspired haciendas and classic Tudors, to breathtakingly beautiful Victorians or ultramodernist Frank Lloyd Wright era homes. Architecturally, Ghent is a visual smorgasbord that has been well curated over decades. Honestly, it’s honestly hard to imagine Ghent without the strip of street that connects the Elizabeth River with the Lafayette. This thoroughfare of commerce and residences boasts one of the last great video rental stores in the nation along with its adjoining art house cinema, The Naro. If you want it, Colley Avenue probably has it. And if Colley doesn’t have it? Its sister street, Colonial Ave. likely does. From rebel-indie coffeehouses to corporate purveyors of caffeinated sludge. Bicycle shops and frozen yogurt. Pizza joints and some of the best bars in the city. A massive healthcare complex. A wetlands preservation project. A place to get your shoes repaired. An honest-to-god coin operated laundromat. The list goes on and on. Most of the apartment buildings and condos nestled in-between have been there since the turn of the century. Colley Avenue is so much more than a wayfare of commerce. It is the living, beating heart of Ghent. 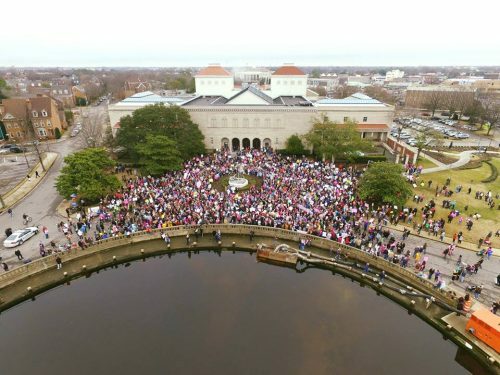 More than anything else, people are what make Ghent unique. It’s easy to get cynical about the hype, but nowhere else in the city can you find artists living next door to bankers living next door to craft brewers. With a population density of around 9700 people per square mile, a culture of pedestrians and cyclists permeates the neighborhood. This kind of density is what allows the eclectic mix of niche businesses and owner operated restaurants to thrive. Ghentites are prone to supporting the arts, caring about the environment, and engaging in activism. Add to that an economic diversity with a mix of upper-middle income established residents with lower income / younger urban professionals and service industry employees? You create a melting pot. A special place that’s not just simply one of the most sought out neighborhoods in the 757 — but also a microcosm that, on its good days, stands as metaphor for the best of America.